I tried a couple of experimental feathers (on the right) before finding an arrangement I liked: solid outline on one side with horizontal lines filling it in, which creates stylized feather shapes. This covers the same blocks that the cross-stitching would, but I find it less irritating to work and more interesting stylistically, while still fitting in with the geometric theme. I am still debating what to do with the row of black feathers above the gold feathers – maybe similar but with a diagonal fill? Something else entirely? 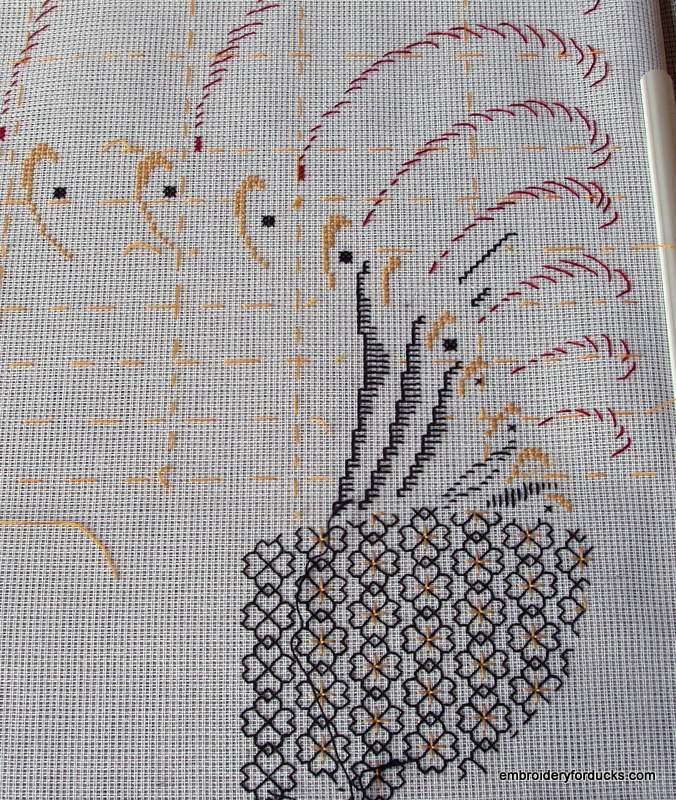 This entry was posted in Blackwork, Cross-stitch, My work and tagged blackwork, cross-stitch, rooster. Bookmark the permalink. Sorry but your on you own here. Your not far enough for me to picture where you going with this. But do have to say I love the design for the body! You might want to do a few more of those lower feathers – love your idea there, by the way! – before you try to work out what to do with the upper tier. Maybe something that will create a slightly lighter effect?